It feels as if I always visit Mumbai during monsoon season. At least that has been the case for both times I’ve been there, including this visit. We got off to a bit of a rocky start in Mumbai. Our flight didn’t arrive until almost midnight. That, paired with the rainy weather and deserted streets, gave the city a sense of gloom. Things didn’t get much better once we saw our hotel room either - the hallway reeked of mildew, and we were jammed in such a small space that we could barely move without bumping into one another. It didn’t help that we were exhausted. Resigned to the fact that we would have to spend the night, we decided to deal with getting a new hotel in the morning. The next morning, after about an hour of going back and forth with hotels.com, we were able to change to a different hotel and get a refund for the obviously misrepresented “4-star” hotel we had to endure our first night. Whew! Once we arrived in our new hotel, things were much better. It was located right on Marine Drive, along Back Bay (informally called the Queen’s Necklace for it’s arced shape), near the Gateway of India, Victoria Terminus, and many other majestic Victorian buildings. I got right to work on designing new pieces for the Spring 2011 collection, and my parents went sight seeing. The first day or two, the sky was covered in clouds, and there was a very light drizzle, if that. On our second day, we decided to take advantage of the comparatively nice weather (it would pour the next day) and headed for Elephanta Island. This is an island which was discovered in the 17th century by Portuguese explorers, who named it after a sculpture of an elephant found near the entrance. 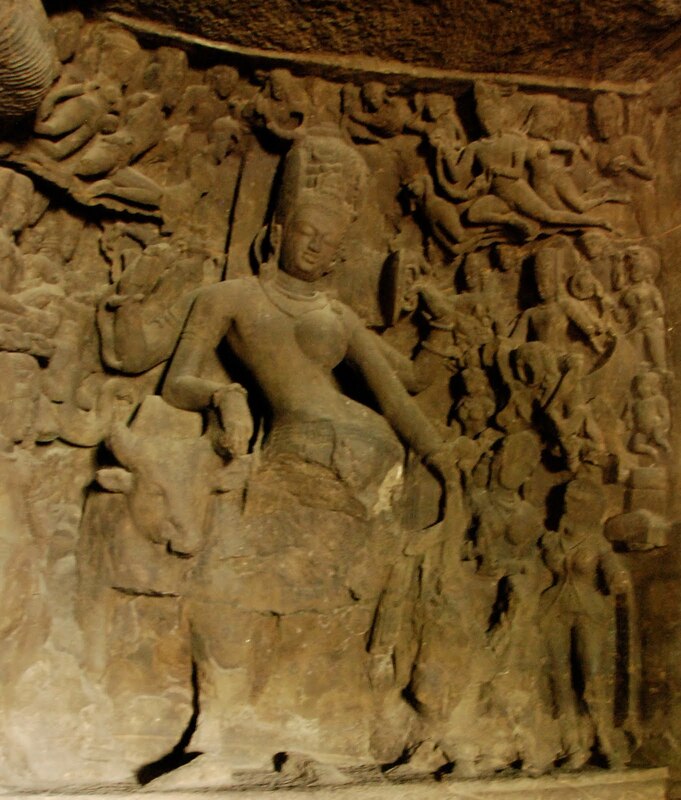 It consists of awe-inspiring temples that were intricately carved by hand out of basalt rock over a period of 200-300 years. The carvings depict many events in the life of the Hindu god Shiva. 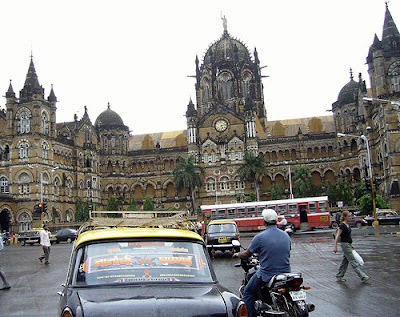 We left from the Gateway of India, in Mumbai Harbor, right across the street form the majestic Taj Mahal Palace and Tower hotel (not to be confused with the real Taj Mahal in Agra). From there, we boarded a ferry, for the hour-long trip to the island. The caves were pretty amazing. To think that they had all been carved by hand was just unbelievable. inside the main cave - all the open space was carved out of rock! 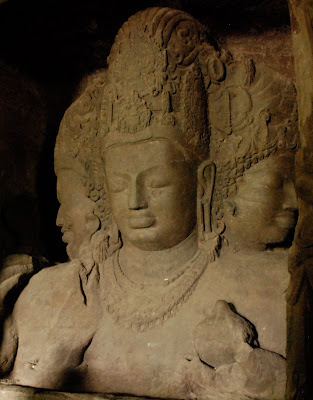 While touring the caves and seeing all the carvings of Shiva, our guide explained to us that the reason Shiva sometimes has so many arms is to show movement. Shiva didn’t really have multiple arms. I thought this was interesting because I never looked at it that way, but once it was explained to me, it totally made sense. The monsoon made everything so lush and green. On the way back to the ferry, our guide showed me a delicate fern-like plant and told me to touch it. I was hesitant at first and wanted to know why, but he insisted that I do it. As soon as my fingers brushed against the leaves, they at once closed in on themselves, as if retreating from danger. It was so cool - a plant that could move as a defense to protect itself. Quite amazing. We headed back to Mumbai, and on our last day, it poured, in true monsoon fashion. It was a good time for me to focus and get a lot of work done, so I didn’t mind the rain.